The 24th VIS Moot will be held in Vienna from 7 to 13 April 2017. 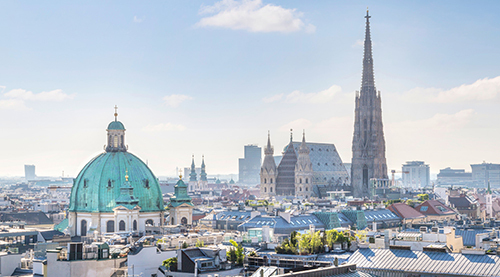 Around 350 teams and numerous arbitrators from all over the world will come to Vienna. Like in the last years lectures, conferences and social activities will be held held during the Moot week. This year's Bergsten Lecture will be given by Cherie Blair, CBE, QC on Sunday, 9 April 2017 from 15.00 to 18.00 hrs at the Austrian Federal Economic Chamber (AFEC), Wiedner Hauptstraße 63, 1040 Vienna, Austria. Currently the Lecture and the following Sky Lounge Cocktail are fully booked. You may revert to arbaut@arbitration-austria.at to check on last-minute cancellations shortly before the event. legislature, trends and implications for doing business"
jointly organized with the Russian Arbitration Association (RAA). The conference takes place on 7 April 2017, 9:00 - 14:00 at VIAC (Wiedner Hauptstraße 63, 1045 Vienna). This year, the conference will focus on Russia's recently effected arbitration law and it's impact on international arbitration, including the arbitrability of corporate disputes involving Russian parties. For more information and a detailed program, please click here. Rubino-Sammartano, the president of the European Court of Arbitration and renowned arbitrator hosts a dinner on 07 April 2017 at Gustl Kocht www.gustl-kocht.at (pay your own dinner – basis). Is the witness statement always a positive tool? A few seats are still available. For reservation please contact Christoph Liebscher (liebscher@disputemanagement.at) until 03 April 2017. 3. ICC YAF/YAAP Conference "Young Approaches to Arbitration"
The ICC YAF / YAAP Conference takes place on 8 April 2017 from 9:30 to 15:00 at the Faculty of Law (Lecture Hall U10), Schottenbastei 10-16, 1010 Vienna. The conference aims to connect young arbitration practitioners of approximately 40 years and under: counsel, arbitrators, corporate counsel and academics. The conference is free of charge, but requires prior online registration. (Kärntner Ring 9, 1010 Wien). Arb|Aut members are entitled to a 20% discount on the registration fee. Please use the promotion code AA410 upon registration.